TIERRA DEL FUEGO, Chile - At 7:45 a.m. on a Sunday in early January, several hundred passengers aboard the Celebrity Infinity huddled with cameras along the starboard railings on the ship's decks, poised for the rounding of Cape Horn. The roughly 2,000-mile journey from Buenos Aires to the tip of South America had taken a week, some of it through treacherous seas, and anticipation was high. As if on cue, bitter-cold wind hurled tiny daggers of ice crystals at the mariners, sending many of the less-stalwart scuttling for the nearest doorway. Others weathered the onslaught and hoped for the best. 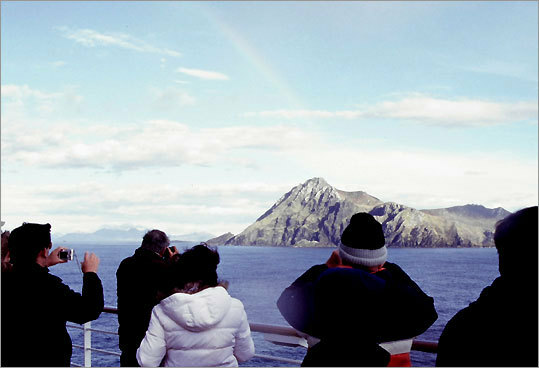 Suddenly, the roiling skies cleared, and a rainbow appeared, glancing off the craggy granite rock face of Cape Horn. "This is what we came all this way to see," exclaimed passenger Bobbi Sorensen of Atlanta. "It was a real thrill!" Her husband, Tom, a seasoned sailboat captain, marveled at the blackness of the granite rocks and the isolation of the continent's southernmost outcropping. "Cape Horn is literally the punctuation mark at the end of the world," he said. Author and on-board historian James W. Reid proclaimed this particular rounding of the Cape the best he'd seen in 100 voyages. "Travel is very uncertain in this part of the world, and the unpredictable weather makes you stop and think: How did [Ferdinand] Magellan . . . do it?" he said. Reid presented slide shows and lectures on South American history, ports of call, and points of interest throughout our 14-day cruise to Valparaíso. "Here, the magic of the past has not faded with time," he said. "You can still relive the days of these early navigators and see the same things they saw as you sail around the Horn and through the Strait of Magellan and the Beagle Channel ." Today, cruising around the tip of South America is much safer, more luxurious, and far more affordable than ever. Celebrity, Princess, Norwegian Cruise Lines, Silversea, and other cruise companies offer a variety of sailings, with multiple ports of call in Argentina, Chile, and Uruguay. Some itineraries also include Rio de Janeiro during Carnival, the Falkland Islands, or Antarctica. The best time to cruise is during our winter months when it is summer in the Southern Hemisphere. But be forewarned: High winds and cold temperatures in Patagonia and Tierra del Fuego can make for wintry conditions, even in summer. Like many Cape Horn passengers, Mary and Dennis Murphy of Groton were eager to chart a new course. "We haven't been to South America and wanted to get a general feeling for the area, so we can decide whether to return and explore it in greater depth," said Mary. "We also were attracted to this cruise itinerary by the prospect of seeing beautiful natural features and unusual animals, such as penguins and sea elephants." Although the couple had sailed on smaller ships, this was their first cruise aboard a 2,500-passenger liner. "It's a great value for the money," Mary said. "There are tons of choices in excursions and activities - something for everybody. The ship also has great food and amenities. If you are interested in rounding Cape Horn, you couldn't do it on a smaller vessel for the same price." Passengers traveled from 38 countries to sail aboard the Infinity, creating what Allan King , the cruise director and a native of Scotland, likes to call a "floating United Nations." Evening entertainment featuring Argentinian gauchos and Latino singers, afternoon tango lessons and optional rodizio dinners (where meat is grilled on skewers) added a south-of-the-equator flair. "Anybody approaching South America has to look with open eyes and expect the unexpected," King said. To get the most from the voyage, he recommended passengers research the ports of call and book excursions well in advance. "This is a different type of cruise vacation than you will experience in the Caribbean or Alaska," King explained. "In South America, the port cities are gateways to places of interest." On the morning the Infinity arrived in Montevideo, Uruguay, our first port of call after leaving Buenos Aires the day before, thick sides of beef, pork, and lamb were sizzling on wood-fire grills at small bistros inside the cavernous Mercado del Puerto near the port terminal. A pleasant walk through the Old City took us past timeworn Parisian-style buildings, open-air fruit markets, and vendors' stalls to the immense Plaza Independencia. In the center of the square, a regal bronze statue of General José Gervasio Artigas on horseback honors the "father" of Uruguay. That afternoon, we traveled 45 minutes by bus north from Montevideo to the Juanico Winery in Uruguay's principal wine-producing region for a leisurely drive through the estate's 600 acres of lush vineyards and a tour of their oak-barrel aging cellar. Inside the wood-beamed tasting room we sampled six wines, including a 2002 Preludio Barrel Select, an elegant blended red. Many passengers in our tour group purchased bottles to take back to the ship. A sea lion bobbing in choppy waters was the first to greet the Infinity at Puerto Madryn, a rather drab Argentinean town founded in 1865 by Welsh settlers. Despite its lackluster appearance, the area is a jumping-off point for rich nature areas. To the east, the Valdes Peninsula, one of South America's finest wildlife reserves, is home to immense southern sea elephants, sea lions, seals, and flocks of sea birds. One hundred miles to the south, the Punta Tombo Penguin Rookery hosts the largest penguin nesting ground on the continent and is the best place to rub elbows with an estimated 2 million Magellan penguins. "Part of the attraction of South America for nature lovers is the opportunity to sail the southern oceans and encounter distinct populations of sea creatures, birds, and land-dwelling animals that you don't see in the Northern Hemisphere," explained Milos Radakovich, our on-board naturalist. Our often bumpy, dusty three-hour ride to Punta Tombo took us through arid scrub land, reminiscent of Baja California. Sparse herds of fuzzy brown guanacos, or wild llamas, munched dry grass far from the roadside. At the rookery, a pebble pathway led through pocked rolling hills, where fluffy gray penguin chicks snoozed in shallow burrows or peeped incessantly for their parents. The handsome black-and-white adult birds paraded single-file across the path. From a lofty viewing area atop a precipice on the seacoast, we gazed down at thousands of penguins, bobbing in the chilly waters for fish and sprawling on the sandy shore. "We saw the march of the little, or fairy, penguins in Australia," said Judith Goldstein of South Windsor, Conn. "We loved it and selected this tour because it enabled us to view penguins in their natural habitat." The fierce winds of Patagonia kicked up a blinding dust storm when we returned to the Infinity, delaying boarding for two hours. At times the thick dust nearly obliterated the shoreline and another cruise ship nearby. This blustery send-off from Puerto Madryn proved to be the initial salvo of a major gale that packed sustained winds of 60 miles per hour with gusts up to 90 miles per hour, and sent 30 foot waves crashing against the ship's hull. For the next two days, sailing was rough. The Infinity's public-address system chimed early on the morning we were scheduled to drop anchor off Stanley, the capital of the Falkland Islands. Captain Athanasios G. Peppas, a veteran of 10 Cape Horn voyages, explained that heavy seas would prevent the ship's tenders from transporting passengers to shore and, therefore, the visit to the Falklands was canceled. Later that day Peppas told us it is not uncommon for foul weather to scuttle disembarkation plans in the Falklands. "This is not just a cruise; it's an adventure," he said. Fortunately, the seas calmed as we neared Tierra del Fuego ("land of fire"), assuring us our memorable rounding of Cape Horn, which was named after the Dutch town of Hoorn, the birthplace of navigator Willem Schouten. In 1615, the prominent Dutch merchant Isaac Le Maire raised money and hired Schouten to lead an exploratory voyage in search of an alternate route from the Atlantic to the Pacific, south of the Strait of Magellan, which was charted a century earlier. Schouten succeeded in finding that southerly route, known as the Strait of Le Maire, in 1616. After leaving Cape Horn, the Infinity sailed up the Beagle Channel to Ushuaia, Argentina, which calls itself the southernmost city in the world. Nestled along a small, boat-studded harbor, this frontier town exudes a slightly Bavarian flavor, with its peaked clock tower and Alpine-style buildings. On San Martin Street, we shopped for jewelry, sheep's wool throws, and leather jackets while checking the menu offerings of local restaurants for king crab and grilled steaks. Our afternoon excursion took us through dramatic vistas in Tierra del Fuego National Park aboard the rather touristy and pricey "train at the end of the world." The remaining days of our cruise included stops at two Chilean ports of call. Punta Arenas, the oldest and largest city in Chilean Patagonia, offered a spectacular view from atop Hill of the Cross Lookout and an opportunity to walk through the lavish mansion, now a cultural center, built by Patagonian pioneer Mauricio Braun in 1905. Puerto Montt, originally a German settlement and now the gateway to the southern lake area, featured the area's largest artisan market, with a tremendous selection of handcrafted clothing, jewelry, and leather goods, just a few minutes walk from the passenger terminal. The highlights were our evening sail past the five ice-blue glaciers glittering like crown jewels along the Beagle Channel west of Ushuaia and the full day we spent wending our way through the Chilean fiords. At times snow-etched peaks loomed above the Infinity, casting long shadows on passengers sunbathing below on the ship's top deck. Before disembarking in Valparaíso, each passenger received a certificate commemorating the voyage. For Harvey and Harriet Ellis of Warminster, Pa., completing the nearly 4,000-mile cruise was a triumph. "We're living in a time when middle-class people can travel to exotic places that were impossible to reach, except for the very well-to-do, even a century ago," Harriet said. "Cape Horn is literally the world's last outpost, and we decided that if Magellan could do it, so could we." Claudia R. Capos can be reached at capocomm@sbcglobal.net. Fly into or out of Ministro Pistarini International Airport in Buenos Aires and Arturo Merino Benítez International Airport in Santiago, depending upon your cruise itinerary. Book a Cape Horn cruise on one of the major cruise lines. Celebrity, Royal Caribbean, Holland America, Princess, Norwegian, and Silversea all offer voyages around the tip of South America.